Just for a day, what would it be like to really listen? Instead of thinking of the next witty response or check mate argument ender, why not just quietly listen to what others are saying. What could we learn – from others? From ourselves? From the silence? This post was inspired by Day 339 in Beautiful You: A Daily Resource for Radical Self-Acceptance by Rosie Molinary. 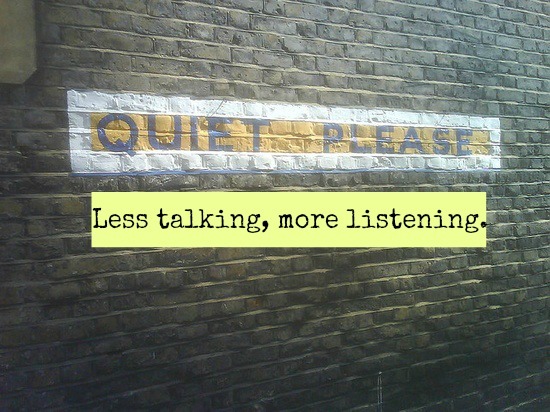 Do you struggle with listening and silence (or is that just me)? What have you learned from being quiet? This entry was posted in A Yoga Story and tagged introspection, learning, quiet, silence, wisdom by Teacher Goes Back to School. Bookmark the permalink. I believe I do struggle with listening. I think I know where the other person is going so to save time I just say it for them, or ‘sum it up’. Not good! I’ve recently begun practicing giving others the courtesy of just keeping my mouth shut and letting them speak so that I can really hear them…I mean, ‘really hear them’ and when I do people respond positively, they respond in a way that a person who’s been heard responds. I think they feel validated and that’s a good thing.